Pond Netting & Nets, Mesh Covers, Heavy Duty Water Garden Netting We have the best prices on pond netting from Laguna, Tetra, & Aquascape. Keep out leaves, cats, raccoons & big birds from harming your koi & goldfish. To remove debris and prevent debris from entering your pond, handled nets and cover nettings are a must for any pond owner. 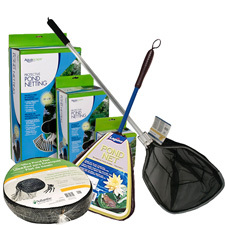 We offer a wide selection of netting, fish and skimmer nets for the most conscious of all pond owners. Use cover netting not only to catch falling leaves, but to secure the safety of your fish from predators. Available in 1/2" and 3/8" mesh openings. These nets are designed for general maintenance and handling fish. From mini, medium and professional grade you're bound to find one that will fit your needs. Ideal for quick and easy removal of light surface debris. These nets have a soft fine mesh.